To the Editor Hicks and colleagues1 highlight several ways in which operating room briefings improve patient safety and surgical quality, citing 4 categories of outcomes in their Table 2 that are aligned with Medicare incentives to reduce 30-day readmission rates. The concept of quality, however, has grown increasingly multifactorial in measurement and application. 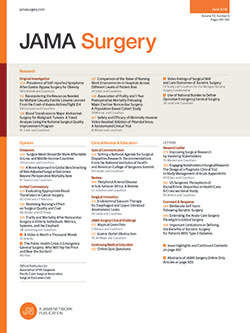 For instance, of the 3 domains of quality in the Centers for Medicare & Medicaid Services’ Hospital Inpatient Value–Based Purchasing Program (clinical process of care, patient experience of care, and mortality outcomes), the patient experience of care counts for 30% of a hospital’s overall score.2 Whether patient satisfaction surveys are valid as an independent measure of surgical quality3 remains a subject of ongoing investigation, but the influence of the patient experience on what has been called the “trauma of hospitalization”4 merits attention, both in principle and as it applies to public reporting and hospital reimbursement. Until someone inadvertently shares something the patient wished left unspoken. A professional, dedicated surgical team lets the patient know they are the focused object of their desire to deliver the best care to the patient - without this claptrap.